The makers of many of our favorite decoys often remain in anonymity. Sometimes, all we have is a name to go by. Yet seldom is that a dilemma faced when the maker is a contemporary carver. But so was the case with John Southworth, a collector from Minnesota, who shared photos of some of his favorite decoys by a carver named David Schroeder, who reportedly lived near Oshkosh, Wisconsin. Gary Hall, a dealer from Ohio who had sold him the decoys, said they were made in the 1970s. As many from the Badger State, Schroeder became a duck hunter. He first went with Gary Koelbl, a friend and decoy collector, who also lived in Oshkosh. When he priced decoys to put together his first hunting rig, he found them to be expensive. So in 1956, with no training or experience at all, he decided to make his own. That first year he made about three or four dozen decoys. He used them for a season then sold them, using the extra money to purchase Christmas gifts. Koelbl was responsible for introducing Schroeder’s work to Hall, who stepped in to market them. While admitting that those early efforts were rather crude, Hall claims he’s never saw a carver improve as much or as fast as Schroeder. Unfortunately he no longer has any of the early models to offer in comparison. Having continued this routine for over a period of now 30 years, Schroeder figures he has carved between 1000 and 1200 hunting decoys and nearly 300 decoratives, his preference today. At one time he received a huge check for a large order of green-winged teal from a gun club on the Chesapeake Bay, but realizing the impossibility of the task, he immediately returned it. Throughout his carving career, the majority of Schroeder’s output has been teal, followed by mallards. He’s also made wigeons, bluebills, pintails, wood ducks, canvasbacks and coot. And no two are exactly alike as he draws his pattern directly onto the wood. He then cuts out the blank with a bandsaw and secures it in a vice. A drawknife is used to rough out the shape, which is refined with a rasp, chisels and sandpaper. He turns the heads on a grinder set in a lathe. A selection of carving knives is used to complete the decoy. His early decoys have his initials "DJS" carved into the bottom. 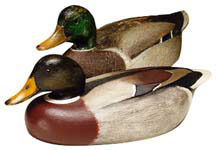 All of Schroeder’s early decoys are hollow-carved of redwood, a rare commodity in Wisconsin. He salvaged it from a water tower that was torn down in Oshkosh. The redwood has long been exhausted, so he now uses basswood. His son owns a sawmill, providing him a lifetime’s supply. Now that Schroeder has focused his attention on decorative carving, it’s been ten years since he’s made a working decoy. Most of his carvings stand on carved wooden feet and exhibit incredible detail. The feathers are burned with a soldering iron sharpened to a fine point. They are painted with acrylics. Schroeder says it takes about ten hours to carve a decorative, and sometimes just as long to burn and paint it. Currently 66 years old, Schroeder claims he’s earned every gray hair. After working years as a troubleshooter for a concrete company, he’s now retired, spending his spare time, between projects, with his wife, three children and five grandchildren. He greets each day with "whatever strikes him at the time." Anonymity? That probably suits David Schroeder just fine. For the complete story, please see the March/April 2001 issue of Decoy Magazine.